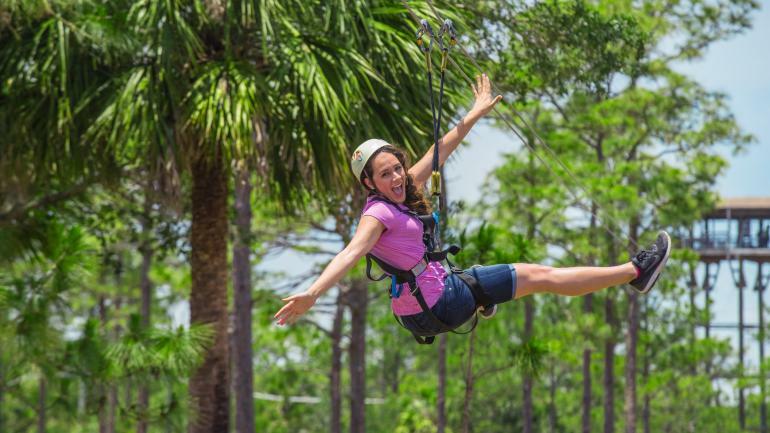 Visit the USA recently highlighted Orlando Tree Trek on it’s list of surprising outdoor adventures and attractions in Kissimmee. Read Visit the USA’s article here or check out what they had to say about Tree Trek below. Forget on-the-ground obstacle courses. Instead, follow aerial trails with nearly 100 activities, including swings, nets, ropes and suspension bridges, in a six-hectare forest at Orlando Tree Trek Adventure Park. Start with easy obstacles, then feel the thrill as the course climbs higher and higher into the pine trees. Save the best for last with a 130-meter zip-line plunge through the forest canopy. Don’t be afraid; thorough training is provided. Adventurers are securely harnessed to safety lines, and courses are ranked according to height or the skills needed. Additional courses are offered for children, and the youngest kids can enjoy following trails on the ground. We climb rain or shine. Limited number of climbers in each departure. Reservations are recommended. Departures start at 8:30 am. Hours are seasonal so please check the time blocks when you make your reservation.